“This time I want to do my best to land as far as possible in the General Classification. Team Katusha Alpecin has an interesting team with some of our new riders at the start." Katusha Alpecin is expected to build on the success of their 2016 season when they start the 2017 UCI WorldTour calendar at the Santos Tour Down Under. Santos Tour Down Under Race Director Mike Turtur confirmed the full rider line up for Katusha Alpecin today. “Tiago Machado will show his competitive streak after being awarded two combative jerseys across two stages at this year’s Vuelta a Espana,” said Mike Turtur. Portuguese rider Machado is somewhat of a Santos Tour Down Under veteran, making his debut at the race in 2012 finishing third overall and is very much looking forward to returning. "I'm looking forward to returning to the Santos Tour Down Under,” said Tiago Machado. “The last few years at the race have given me great pleasure. This time I want to do my best to land as far as possible in the General Classification. Team Katusha Alpecin has an interesting team with some of our new riders at the start." 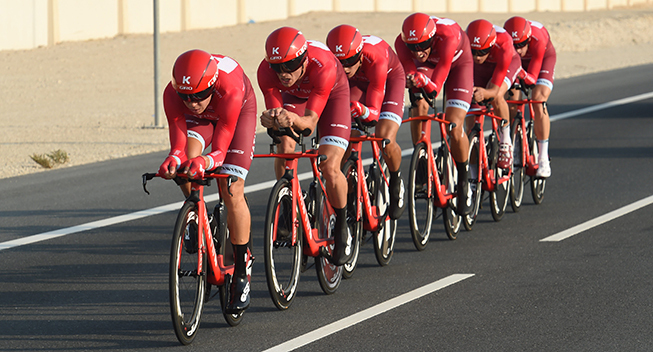 The Katusha Alpecin team for the 2017 season will field 26 riders from 14 countries; Austria, Belgium, Colombia, Croatia, Denmark, Estonia, Germany, the Netherlands, Norway, Portugal, Russia, Slovenia, Spain and Switzerland. The Team Katusha Alpecin rider roster competing at the 2017 Santos Tour Down Under will be led by sport director Gennady Mikhaylov (Russia) and includes riders Tiago Machado (Portugal), Angel Vicioso (Spain), Jose Goncalves (Portugal), Maurits Lammertink (The Netherlands), Baptiste Planckaert (Belgium), Sven Bystrom (Norway) and Jhonatan Restrepo (Colombia). Team Katusha Alpecin riders at the 2017 Santos Tour Down Under will join already confirmed riders, UCI World Road Champion Peter Sagan (Bora Hansgrohe) and ORICA-BikeExchange (to be known as ORICA-SCOTT)- riders Esteban Chaves, Simon Gerrans and Caleb Ewan.